Xiwanzi (Hebei) China – The Chinese company Beijing Raissun Investment Co. Ltd, owner of Thaiwoo Ski Resort in China’s Hebei Province, and the French ski lift company POMA this week signed a strategic partnership to develop Thaiwoo. The resort is expected to be one of the sites hosting the 2022 Beijing Winter Olympics and with a proposed build-out calling for 45 lifts — enough to accommodate 33,235 skiers daily on nearly 1,100 acres — promises to be one of China’s biggest ski resorts. Through this agreement, Thaiwoo Ski Resort will choose POMA as the preferential supplier for all upcoming lifts installed at the resort. POMA has already built three lifts at Thaiwoo: one two-stage gondola and two detachable bubble chairlifts. This is a potentially lucrative agreement for POMA, as Thaiwoo’s budget for lifts may exceed €200 million (US$212 million) over the next five to 10 years. To support lift maintenance, POMA will open a spare parts storage center in the Chongli region near Thaiwoo. The center will have POMA teams available who will be dedicated to maintaining the Thaiwoo lift installations. 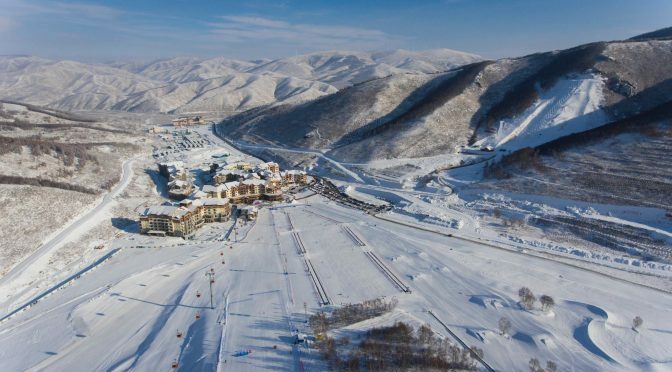 Thaiwoo Ski Resort is located adjacent to the Great Wall in the Chongli district of Zhangjiakou, a city located approximately 200 kilometers (124 miles) west of Beijing. Construction of the resort began in April 2014 and it first opened in December 2015. Development is projected to span three phases over the next 10 to 20 years, with a total investment of €2.7 billion (US$2.86 billion). Spanning 24 square miles, Thaiwoo will be open all year for four-season activities. When it’s finished, the ski area will count 200 ski runs, 45 lifts, 3- to 5-star hotels and private residences in a European-style pedestrian village. During the first phase of development, this represents 2,200 hotel beds and 600 residence beds.